What and where do we monitor? Water Quality Parameters: Dissolved oxygen, phosphorus (total and dissolved), nitrogen (nitrates and ammonia), suspended solids, pH, water temperature. 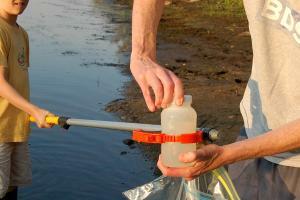 Testing is done at 24 sites throughout the watershed. Streamflow and groundwater levels: OARS maintains staff gages to measure streamflows at nine tributary stream sites in the watershed; streamflow is recorded for these sites with every water quality sampling. Groundwater levels are recorded from the USGS monitoring well in Acton. Availability of physical habitat: estimating the amount of the streambed that is covered with water gives an estimate of the amount of physical habitat available to fish. More about assessing physical habitat. More information for our water quality volunteers. Click here.